Jack Gamble is a 25 year-old man wrestling out of Missouri who was trained by the legendary Harley Race. Gamble started with Race’s World League Wrestling (WLW) in 2009. Since then Gamble has showcased his skills in a few other promotions at shows in the American mid-south. Some companies Gamble has worked for include Metro Pro Wrestling (MPW), ZERO 1 USA and Dynamo Pro Wrestling (DPW). If you’ve never seen a WLW match before it is important to note how versatile the wrestling can be. Race himself was versatile in his heyday and could brawl just as easily as he could whip out some technical stuff. Of course 450 splashes weren’t so big when Race was in his prime, but now that they are they are at full display in WLW. At a WLW show on April 21, 2012 Gamble took on Elvis Aliaga. 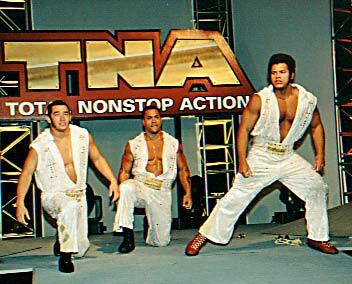 This Elvis may not have been a member of TNA’s The Flying Elvises, but the crowd takes to him just the same. With the fan support behind Aliaga, Gamble plays the heel and does some worthwhile selling throughout the bout. There are some nifty little things to look out for as well like Aliaga being on fire only to be stopped by Gamble with a simple back elbow. It takes me back a little to AJPW in the 1990s when Mitsuharu Misawa or another great talent would be clobbering Jumbo Tsuruta with a variety of offense and Tsuruta would halt it all with a simple move. For the finish Gamble performs one of those aforementioned 450 splashes…but misses it! All in all this was a good show by both men with a surprising finish. WLW is not currently promoting any upcoming live shows. To check out a poster from their most recent show though held on September 27, 2014 click here. For the full results of this WLW show that took place on April 21, 2012 click here. For more in the 25 and Under series featuring well trained young American wrestlers click here and here.